CM Magazine: Hustle. (Sports Stories). Toronto, ON: James Lorimer, 2014. 123 pp., pbk., hc. & epub, $9.95 (pbk. ), $16.95 (hc. )., $7.95 (epub). ISBN 978-1-4594-0604-9 (pbk. ), ISBN 978-1-4594-0605-6 (hc. ), ISBN 978-1-4594-0606-3 (epub). Johnny watched the game closely. He looked for areas on the court where he could make plays when he got his chance to play. Rex was spectacular. Rex shot three-point baskets on four straight plays. He shot the last one from just inside the half-court line. That one hit nothing but net. The crowd gasped in admiration. Johnny looked around and noticed that there wasn't an empty seat in the gym, everyone was there to watch Rex put on a show. He was anxious to show the large crowd what he could do. Late in the second half, Coach Tanaka pointed at Johnny to sub in and play point guard. Playing point guard meant he'd be calling the plays. It was his job to make sure everyone was on the same page. The ball would be in his hands most of the time. This was his chance! Johnny, or Hustle, as he is nicknamed, just wants to play basketball. He knows he is a good player, but he wants to be a spectacular player like his friend, Rex, who is a year older and in grade ten. Johnny and Rex are best friends, but Johnny is envious of Rex's talent as a basketball player. It seems that every basketball Rex touches swooshes through the net, and he can do no wrong on the basketball court. To add insult to injury, all of the coolest girls are after Rex, including Tracy. Hustle has a crush on Tracy. Hustle takes place in British Columbia where Hustle and Rex live in an impoverished community and Rex is dabbling in the darker side of life. He is beginning to skip school to hang around with some questionable older characters, and he's drinking. Hustle doesn't know what to do. He is conflicted. On one hand, he wants to help Rex stay away from his new friends - he wants to save Rex. However, on the other hand, he sometimes avoids Rex and distances himself from him. 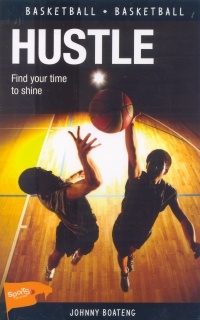 A great hi-low interest book, Hustle is part of Lorimer's "Sports Stories" series written to entice students to read. Author Johnny Boateng does a great job of making the book exciting on many levels, and the book is full of adventures, such as being chased, being in a brawl, and being in many fast-paced basketball games. The basketball theme is strong and carries the plot well. Boateng obviously knows the game and effectively conveys the action and tension on the court. Hustle and Rex's team, the Hill Academy Knights, are not the best team on the floor, although they work hard and have a lot of enthusiasm. They are always in danger of being eliminated from various competitions. The subplot of Hustle and Rex's complicated friendship works well, too. The characters are believable and easy to relate to. Adolescent readers will be able to understand the issues arising between Hustle and Rex, from envy of wanting to be the best basketball player on the team, to being envious of the girls chasing Rex. Rex is almost always the MVP, and Hustle covets that award, wondering why Rex always gets it when he doesn't put in as much practice time as Hustle does, and he misses practices. Readers can also easier relate to Hustle as he worries about Rex and the kind of people he is beginning to hang around with. Hustle kept my interest throughout. I wanted to know what would happen to Rex. Would he succumb to the 'dark' side and quit school to hang out with the local druggies? Would Hustle realize that Tracy used people and that Amy really liked him? Would Hustle quit being jealous of Rex and fit comfortably in his own place on the team? Would the team win the final championship? In the end, I was satisfied with the way the story wrapped up. It was a good read. Mary Harelkin Bishop is the author of seven books and is most well-known for the "Tunnels of Moose Jaw" time travel adventures. Currently, she is employed as a Literacy Teacher for Saskatoon Public Schools where spends most of her time working with teachers and students at Princess Alexandra Community School. NEXT REVIEW | TABLE OF CONTENTS FOR THIS ISSUE - May 30, 2014.